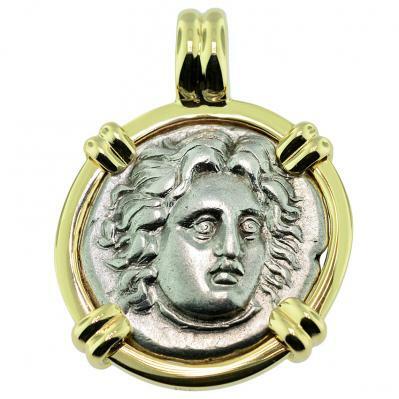 SOLD Helios Didrachm Pendant; Please Explore Our Greek Pendants For Similar Items. In Greek mythology, the sun was personified as Helios. Sun worshipping is an ancient tradition and the Greeks were especially serious about their devotion to their solar deities. Helios was imagined as a handsome God, crowned with the shining aureole of the sun. He drove his chariot of the sun, drawn by the fire-darting steeds Pyrios, Aeos, Aethon, and Phlegon across the sky each day to Earth, circling Oceanus and through the world-ocean, returned to the east at night. 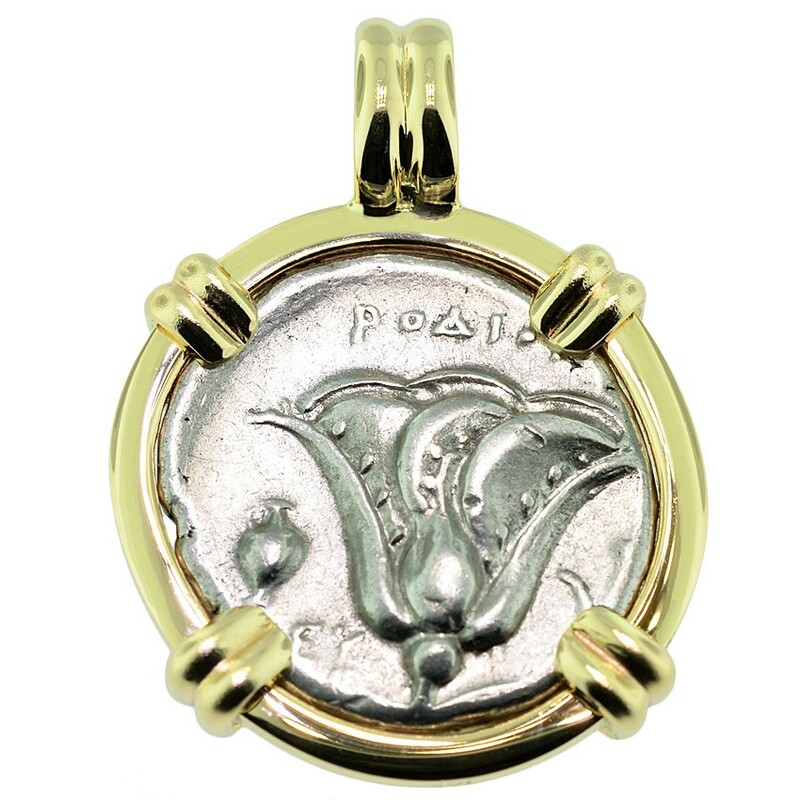 The obverse of this ancient hand struck coin, depicts the facing head of Helios. The reverse shows a rose bud, which is an allusion to Rhodos, the name of the city which issued this coin. During the Middle Ages, the head of Helios on these coins was thought to be the image of Christ. Hence, the finding of these coins while plowing a field was not only a monetary windfall, but also a sign of good luck. 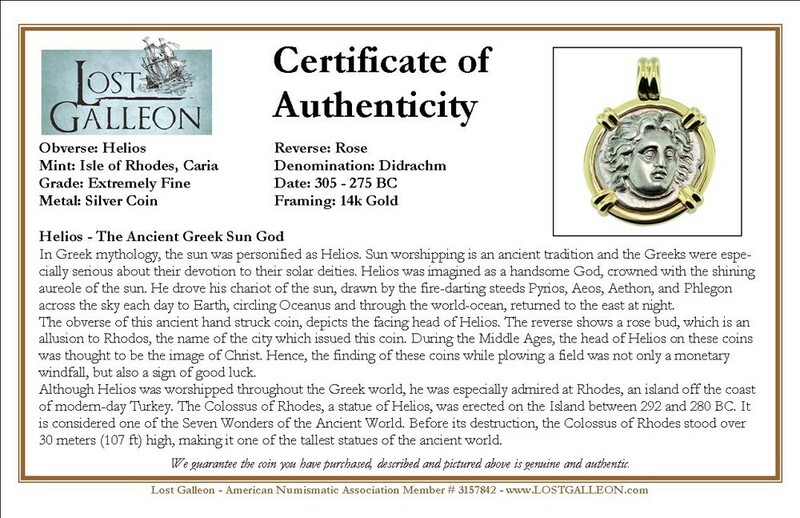 Although Helios was worshipped throughout the Greek world, he was especially admired at Rhodes, an island off the coast of modern-day Turkey. The Colossus of Rhodes, a statue of Helios, was erected on the Island between 292 and 280 BC. It is considered one of the Seven Wonders of the Ancient World. Before its destruction, the Colossus of Rhodes stood over 30 meters (107 ft) high, making it one of the tallest statues of the ancient world.